No child is too young to begin learning about the greatest love story of all--God's love for his people, as portrayed in the Bible. David Helm and Gail Schoonmaker have together created a colorful book of Bible stories written especially for children ages 2-7. Rather than simply retelling portions of the Bible, this book presents the big picture--the unified story running through the Old and New Testaments. Twenty-six stories together form parts of this big picture. Simply written and beautifully illustrated, this book teaches children the Bible's whole story so they can begin to appreciate the fulfillment of God's promise to his people. The Big Picture Story Bible is perfect for parents to read to their children and for older children to read on their own. 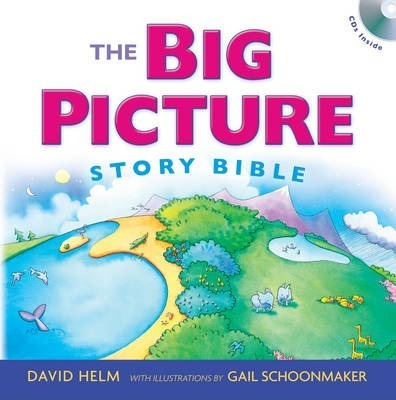 First published in 2004, The Big Picture Story Bible has been widely praised and used by parents. It now comes with an audio recording of the book, read by the author and presented on two CDs, one each for the Old and New Testaments. Great for Sunday school classes and trips in the car, children can listen to the text and follow along in the book. David R. Helm serves as lead pastor of the Hyde Park congregation of Holy Trinity Church in Chicago. He also serves as Chairman of The Charles Simeon Trust, an organization which promotes practical instruction in preaching. He is the co-author of The Genesis Factor (with Jon Dennis), a contributor to Preach the Word: Essays on Expository Preaching, and the author of The Big Picture Story Bible and 1 and 2 Peter and Jude in the Preaching the Word commentary series.